An inspiring and entertaining collection of essays from the online newsletter for speakers - all original work from the mind of Coach MikeLandrum. In them, you'll explore the problems that public speakers encounter as well as the pleasures of this subtle and elusive art. Here you will find practical tips and startling insights that arise from or relate to the art and craft of speaking. 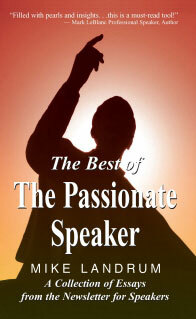 "I never get tired of reading and re-reading The Passionate Speaker . . . a real treat!" Now also available as an e-book!